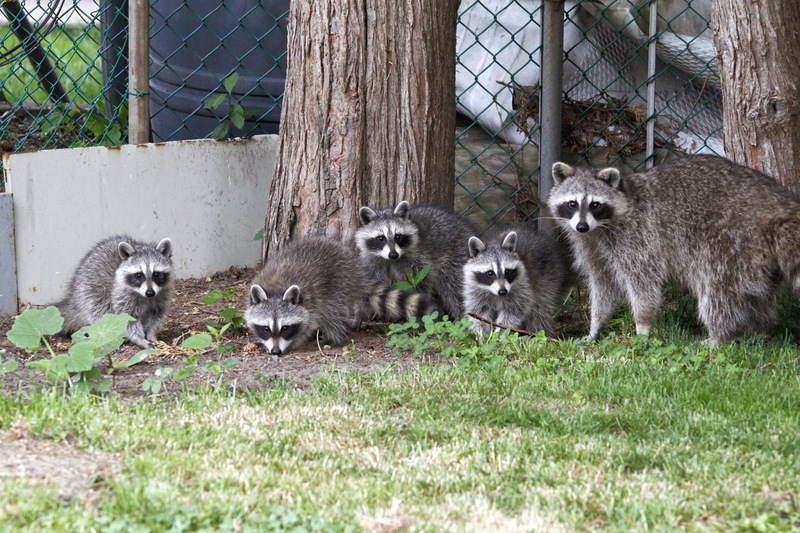 Our backyard family of raccoons. After the birding madness of May, and the stressful events of Peregrine Falcon "fledge watch" in June, July is a welcomed month. A time to sit back, relax and enjoy the backyard. And were not the only ones who enjoy our yard. 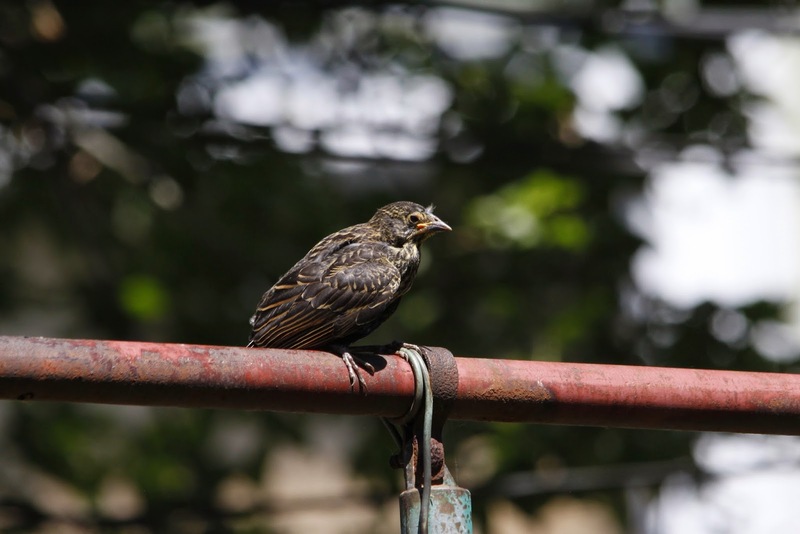 The Baltimore Orioles are back for the summer, and it's always fun to watch our year round birds, including Blue Jays, House Finches, Downy and Hairy Woodpeckers, among others, bring their young to the yard to feed and educate them on the ways of the world. We have an almost nightly visit from a raccoon family who love to drink and bathe in the ground level bird bath after they clean up any spilled seed from under the bird feeders. Last Sunday we witnessed something in the yard we had not before. A male Red-winged Blackbird was bringing one of his young to the yard. He was a funny looking little thing, still had some down around his beak. I almost felt like "Daddy" left him with us to babysit. He flew him in, feed him, and then took off. He'd come back every 20 minutes or so, check on him, feed him again, and they'd sometimes fly to a different spot in the yard. This went on for most of the afternoon. I wouldn't let Rob walk to the back of the yard in case he spooked him. It was fun to watch the young Red-winged Blackbird. He'd stay where his father left him until he returned. He'd poke around at the ground and look around with curiosity. I'm sure we witnessed his first bath, because he had quite the time once he discovered the bird bath. It was a lovely and relaxing way to spend the afternoon. Daddy giving him some grub! Where you can find us during summer weekends. 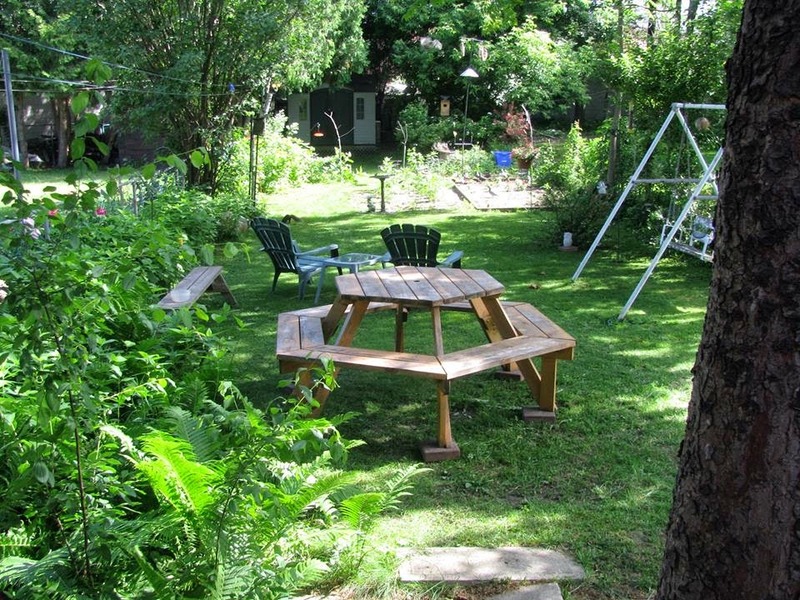 I'm going to Nova Scotia tomorrow for a week to visit with family and friends, but when I return Rob and I plan on spending most of our free time enjoying the backyard with the birds and critters who enjoy it as well. 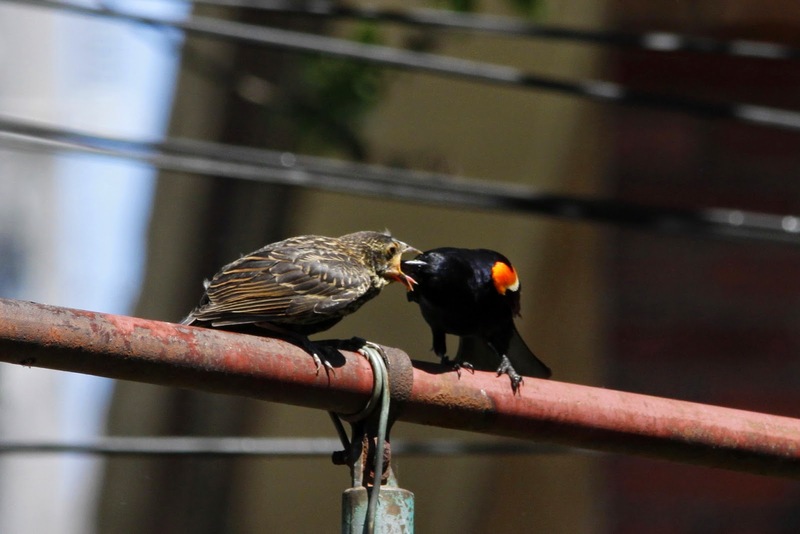 Love your photos, especially baby and papa blackbirds. I have seen Red-winged Blackbirds quite a bit near where I live (New Jersey, USA) but never have gotten a photo. Amazing how different the females and immature males look from the males.